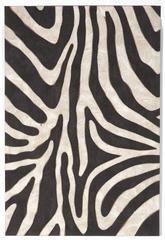 Here you will find a wide assortment of black and white area rugs to fit your home's decor. 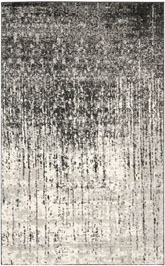 While some of these rugs have true whites in them, most of them are what is considered off-white or ivory colored in appearance, sometimes on the beige tinge. 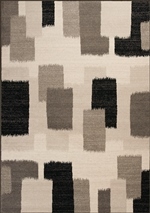 Please refer to the individual rug page's color description and title for color reference. 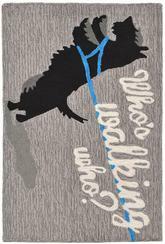 If you are unsure, then contact us and we will be happy to let you know more about our black & white rug's colors. 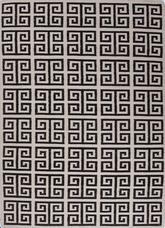 One of the most popular ways to decorate a room and give it a true sense of sophistication is to use black and white for the main color scheme. 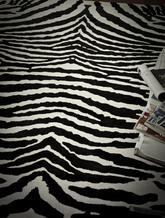 In these types of rooms, a black and white area rug can really make the space look incredible. 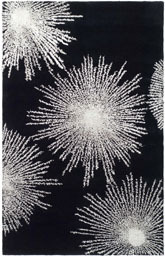 Whether you choose to pair your black and white style with a burst of an accent color to make it really pop or you just plan to keep the space as stylish as possible without deviating from your monochrome color palette, a black and white area rug can help you make the most of your favorite room. 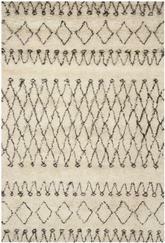 Use these rugs to help you create a lovely, crisp, stylish space that you’ll be glad to show off to everyone you know. 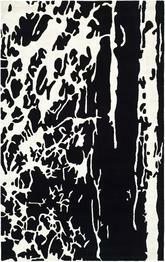 Black and white rugs are usually not as prevalent in traditional styles as they are in modern ones. 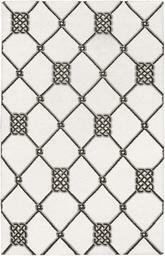 However, it is still possible to find beautiful black and white accent rugs that fit into the traditional style. 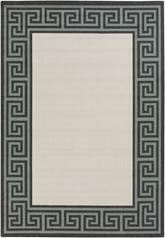 When looking for floor rugs to suit your traditional room without breaking your monochrome color scheme, be sure to pay close attention to the pattern on each rug you examine. You are not looking for anything too bold or abstract. 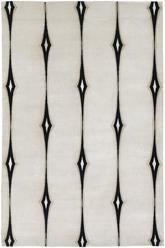 Instead, stick with floral or geometric ikat styles that mimic those of more old-fashioned rugs. 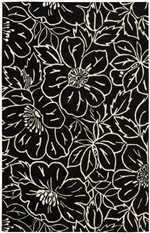 Choose rugs that feature a repeating flower pattern or something else from nature and you will have no trouble sticking with your theme. 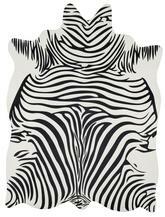 Sometimes, animal prints in black and white can work well for traditional spaces too. 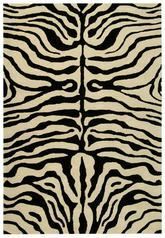 However, stay away from large prints or anything that seems too abstract, and stick to rugs that have animal print borders or smaller patterns. 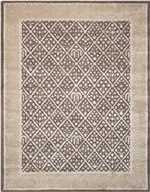 It is always a good idea to compare any rugs you are shopping for in black and white with similar rugs in color to be sure you understand where your rug of choice fits into the world of style. 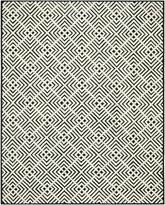 If you see a more brightly-colored rug in a pattern you like, find out if you can locate one in a matching pattern that is in black and white. 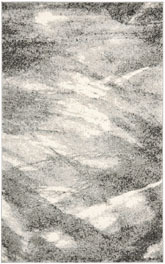 It is difficult to work with monochrome colors in traditional styles, but it is not impossible. With a little creative decorating you can easily have the room of your dreams. 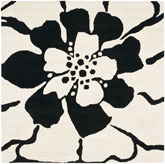 It is so much easier to match black and white rugs to a modern style than it is to work with traditional concepts. 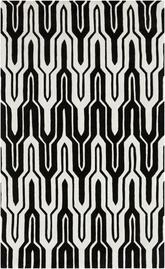 When you plan to decorate your black and white room, your options will be almost limitless when it comes to choosing a modern rug to go with your style. 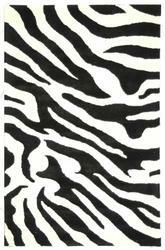 One great option is to work with bold, impressive animal prints. 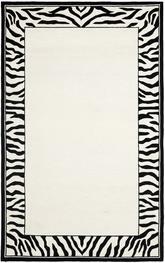 Choose a zebra print rug if you want to give your black and white contemporary space a little extra pizzazz, or go with a leopard print if you really want to mix things up a bit. 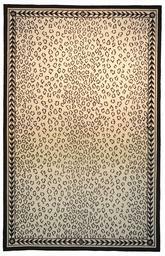 Since leopard rugs are usually in gold and black, a black and white version is sure to turn heads no matter who visits your home. 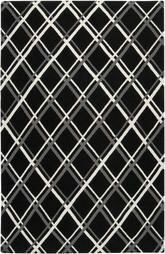 Another great way to decorate a modern space with a black and white area rug is to use chunky stripe, square checkers, or blocks of color. 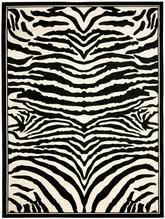 Alternating black and white striped rugs or checks can make a space look incredible, and this is sure to draw attention directly to your rug. 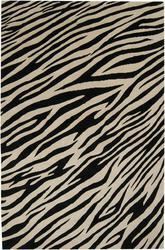 On the other hand, if you prefer for your rug to blend into the background a little bit more, there’s nothing wrong with choosing a solid black or white to complete the look of your room. 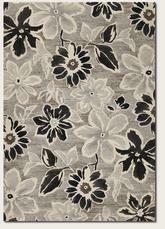 Spread a black shaggy rug on the floor and let it hold the entire decorative look together. 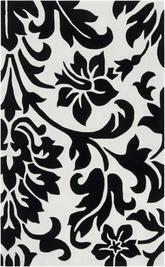 On the other hand, white shag can make a space look crisp and clean, even when you have it furnished with all black. 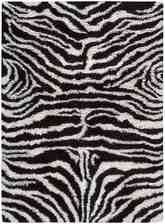 The living room is one of the best places to bring out a black and white rug. 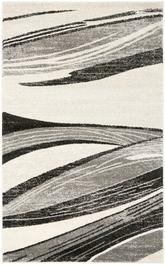 Put down a shag rug in the living room and you will have a comfortable place to walk that pulls the entire look together. 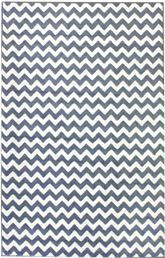 A throw rug on one portion of the floor can expose hardwood or tile underneath, which can further the modern look of your space. If you want to add a burst of color to offset the black and white, try a round red rug near your sofa and other seating furniture. 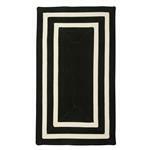 This will draw attention directly to your rug and give your guests something to admire as they slowly take in the black and white room around them. 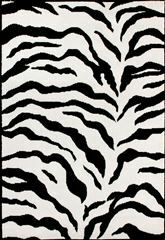 Last but definitely not least, the dining room is a great place to incorporate your favorite black and white style. 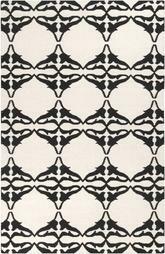 Choose a stark white wall and a matching bright white dining room table or tablecloth, and offset that with black chairs. 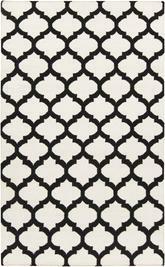 Use white furnishing and black décor around the room, and don’t forget your area rug! 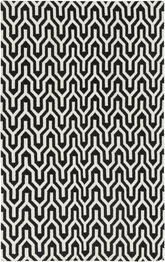 Choose a large, square black and white area rug to bring a refined sense of style to the space, or go for a square rug for something a little more whimsical. 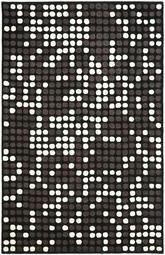 If you want to keep things very casual, you can try a black and white polka dot rug, which is sure to bring a lot of fun into your dining room every time you sit down to eat. 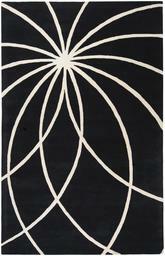 Black and white area rugs can help you make a room look incredibly sophisticated and stylish. 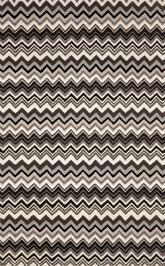 When you incorporate them with other black and white décor and maybe include a pop of bright color here and there, you can make your space look amazing without much effort at all. 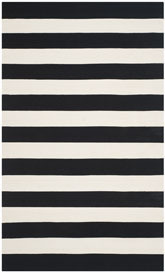 It’s easy to find cheap black and white rugs for sale that can help you style a space without having to break the bank. 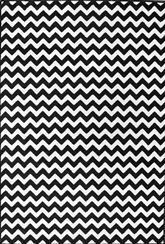 If you’re looking for ideas for how to decorate your room, you can always check out Pinterest to get some good tips for using black and white rugs in any part of your home.